A SOFT DRINK typically contains carbonated water (although some lemonades are not carbonated), a sweetener, and a natural or artificial flavoring. The sweetener may be sugar, high-fructose corn syrup, fruit juice, sugar substitutes (in the case of diet drinks), or some combination of these. Soft drinks may also contain caffeine, colorings, preservatives, and other ingredients. Soft drinks are called "soft" in contrast with "hard" alcoholic beverages. Small amounts of alcohol may be present in a soft drink, but the alcohol content must be less than 0.5% of the total volume if the drink is to be considered non-alcoholic. Fruit punch, tea, and other such non-alcoholic beverages are technically soft drinks by this definition but are not generally referred to as such. Soft drinks may be served chilled, over ice cubes or at room temperature. They are available in many formats, including cans, glass bottles, and plastic bottles (the latter in a variety of sizes ranging from small bottles to large 2-liter containers). Soft drinks are also widely available at fast food restaurants, movie theaters, convenience stores, casual dining restaurants, dedicated soda stores, and bars from soda fountain machines. Soda fountain drinks are typically served in paper or plastic disposable cups in the first three venues. In casual dining restaurants and bars, soft drinks are often served in glasses. Soft drinks may be drunk with straws or sipped directly from the cups. Coca-Cola's secret formula - Mirror Online. COKE CLAIMS TO GIVE BACK AS MUCH WATER AS IT USES. AN INVESTIGATION SHOWS IT ISN’T EVEN CLOSE - The Verge. Diet drinks may be preventing you from losing weight - The Telegraph. Effects of artificial sweeteners on breath alcohol concentrations in male & female social drinkers - Drug & Alcohol Dependence. France bans free soft drink refills in effort to tackle obesity - RT News. 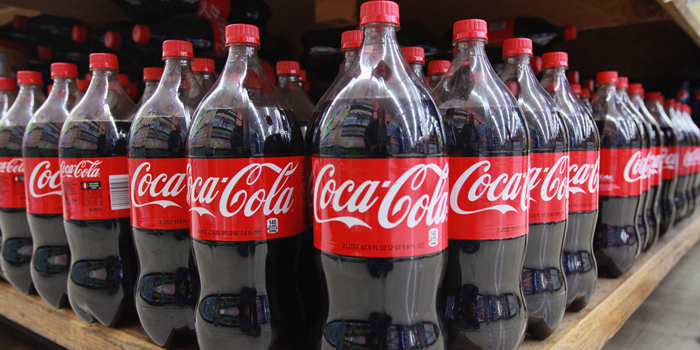 Here’s why McDonald’s Coke tastes better - The Sun. JOHN PEMBERTON - inventor of Coca-Cola. List of soft drink flavors - Wikipedia. List of soft drinks by country - Wikipedia. New Coke - (1985-2002). The unofficial name for the reformulation of Coca-Cola introduced in April 1985 by the Coca-Cola Company to replace the original formula of its flagship soft drink Coca-Cola (also called Coke). In 1992, it was named Coke II. Coke II was discontinued in July 2002. It remains influential as a cautionary tale against tampering with a well-established and successful brand. "New Coke" became synonymous with a product fail. Putting Sugary Soda Out of Reach - The New York Times. The Decline of ‘Big Soda’ - The New York Times. THE ORIGINAL FORMULA FOR COCA-COLA? - This American Life. Almdudler - since 1957. Brand name of a popular carbonated soft drink from Austria. COCA-COLA - introduced 1886. Carbonated soft drink sold in stores, restaurants & vending machines in every country except Cuba & North Korea. DR PEPPER - since 1885. "The Only One You Crave." DRANK - extreme relaxation beverage: "Slow Your Roll!" Fanta - since 1940. Brand of fruit-flavored carbonated drinks created by The Coca-Cola Company and marketed globally. There are more than 100 flavors worldwide. PEPSY COLA - created & developed in 1893. "Delicious. Refreshing. Pepsi." SCHWEPPES - since 1783. Swiss beverage brand that is sold around the world. It includes a variety of lemonade, carbonated waters & ginger ales. SodaStream - since 1991. "Water made exciting." Maker of a consumer home carbonation product based on the principles of making a carbonated drink as originally invented by Guy Gilbey in 1903. The device allows users to take ordinary tap water and carbonate it to create soda water (or carbonated water) to drink. With the addition of one of over 100 different types of concentrated syrups and flavorings produced by SodaStream, owners can create carbonated beverages.